The so-called Digital Transformation is omnipresent and irreversible. It affects all strata of the population and all areas of life. The central term “algorithm” has recently been reduced to a negative connoted interaction between man and machine. Actually, an algorithm is something neutral, a calculation rule that humans have been using for many centuries. 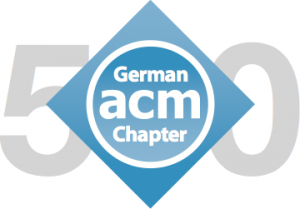 To promote dialogue between algorithm creators – often computer scientists – and users, the German Chapter of the ACM created the Forum Being Human with Algorithms (https://being-human-with-algorithms.org/) on the occasion of its 50th anniversary under the leadership of Marc-Oliver Pahl and Gerhard Schimpf. In addition to professional articles, the forum primarily focuses on people with their personal views on the Digital Transformation. The culmination of the activities was the symposium of the same name in Heidelberg on September 20th and 21st, 2018. The Turing Award winners Vint Cerf, Martin Hellman, Whitfield Diffie, and Bob Tarjan took part among many others. The event started on Thursday in the Alte Aula of the Ruprecht-Karls-Universität Heidelberg with the Turing Award winner Vint Cerf. The co-founder of today’s Internet, based on the importance of the Internet for our society, emphasized the need to work even harder on security, stability, openness and accountability. He appealed to politicians to create the necessary incentives. The symposium Friday at the Villa Bosch studio of the Klaus Tschira Foundation began with a lecture by Martin Arend (BMW) on the possibilities and changes that autonomous driving and personalized assistants bring with them. Katharine Jarmul (KI Project) then spoke about the differences between AI and human intelligence. She emphasized above all the personality that machines do not have. The third speaker was Martin Hellmann (Stanford). The Turing Award winner explained the need for ethical action in all areas of life. Starting from a freely available book recently published with his wife Dorothie, he described how ethical action can be learned and internalized through daily practice, starting on a small scale. Next, Peter Weibel, Director of the ZKM Karlsruhe, examined the artistic perspective. He pointed out how computer algorithms above all create new possibilities of expression in media art and change the medium. His collaborator Bernd Lintermann illuminated the ZKM satellite exhibition OpenCodes, of which three wonderful exhibits could be seen in the Villa Bosch. Michael Strube (HITS) opened the afternoon. He mainly spoke about the risks of Natural Language Processing. He traced the tightrope walk on which research in this field is located since many developments can also be abused – for example for targeted opinion steering. Subsequently, Alexander Filipović, media ethicist at the Munich School of Philosophy, discussed the possible roles of philosophy and ethics in the dialogue on the Digital Transformation, in particular by pointing out areas of action for promoting informed decisions. Franziska Böhm (KIT) concluded by explaining the legal perspective. She mainly dealt with the fact that rules are necessary and that algorithms for legal processes are not the saviour of salvation. Moderated by Thomas Matzner, Vint Cerf, Martin Hellmann, Whitfield Diffie, Katharine Jarmul and Jonas Bedford-Strohm (BR) then discussed the effects of the Digital Transformation. An important result of the panel with regard to the work life is that work gives people dignity. With the increasing digitalization of the work life, and the potential loss of jobs, people need worthy jobs to be happy in the future. In addition to further exciting discussions between the participants, the audience witnessed a “Diffie-Hellmann Seat Exchange,” based on the Diffie-Hellmann Key Exchange, which is used every day for encrypted website calls. The many exciting discussions of the symposium will be continued on the website https://being-human-with-algorithms.org/ in the future. In addition to further interviews with other Turing Award winners, the publication of exciting lecture recordings is planned for the coming months. Next Next post: Unser Symposium 2018 war ein voller Erfolg!